The day after my grandson Kyle’s 6th birthday, I together with the rest of my family joined employees of E. Ganzon Inc. in distributing relief goods to residents of Sitio Wawa in Rodriguez (formerly Montalban, it was renamed after Eulogio “Amang” Rodriguez Sr., Montalban’s first mayor and Senate president, in 1982) in Rizal. Last August 11-13, the area was hit by flash flooding that also destroyed the bridge that connects Sitio Wawa with Sitio Sto. Niño. This wasn’t my first visit to this area. The first time I was in Wawa was way back in 2004 when I was a guest in a demonstration tour, for teacher representatives from 9 different schools, hosted by Lakbay Kalikasan. At Wawa Gorge, we engaged in the adrenaline-pumping sport of rappelling at the gorge’s metal footbridge. Sitio Wawa lies is in between the 426 m. high Mt. Pamitinan and 424 m. high Mt. Binacayan. Its abandoned reservoir is visited mostly by hikers as the jump-off point for the trek to either beginner-friendly mountain, two of three mountains in the well-loved trilogy hike (the other is 517 m. high Mt. Hapunang Banoi). Guide fee is Php500 per group. The two mountains form a scenic view that appears like a portal to the sky, hence the name wawa, the Dumagat term for “entrance.” Sitio Wawa is a habitat of the Remontado Dumagat, mixed-blood offspring of lowlanders, who fled the Spanish colonizers, and of Negritos, the original setters in the area. Legend has it that a giant of extraordinary strength named Bernardo Carpio (our version of Hercules or Atlas) who, in olden times, was trapped by an enkanto (enchanted creature) between Mt. Pamitinan and Mt. Binacayan. He caused earthquakes, landslides and flooding in nearby villages every time he struggles to free himself from his chains or keep the boulders from crushing him or from colliding. José Rizal was said to have made a pilgrimage to Montalban to pay homage to Bernardo Carpio, a versatile symbol of freedom. In recent times, Lavrente “Lav” Diaz has used the legend as organic symbol in his 2016 historical fantasy dram film Hele sa Hiwagang Hapis (“A Lullaby to the Sorrowful Mystery”). The riverbed is said to have a boulder with a hollow that forms what look like a gigantic footprint, attributed by locals to Bernardo Carpio. Historically, the site was used as a hide out by the revolutionary leader Andres Bonifacio who made one of Pamitinan’s caves as the Katipunan’s secret headquarters. Here, Bonifacio and eight of his men entered the cave on Palm Sunday and came out on Good Friday. Here, they declared independence from Spain on April 12, 1895, over a year before the Revolution started. Some 500 meters of narrow passage away from the mouth of Pamitinan Cave is the bulwagan (“hall”), a cavern over 50 ft. high and about 50 ft. in radius. Inscribed on the cavern wall, in what looks like charcoal (possibly soot from a torch), are the words Viva la Independencia. The Pamitinan pilgrimage is held here in April. In 1943, the cave was turned into a Japanese armory. Mary Japanese died here from American fire. In 1977, a concrete marker commemorating them was fixed on the cliff wall over the cave’s mouth, above which is a metal plate, inscribed with Japanese characters with English translation, that reads: “Give them eternal rest, O Lord, and let them share Your glory.” In 1985, the cave was declared a National Geological Monument. It is closed for rehabilitation until further notice. In 1996, the area was declared a Protected Landscape managed by the Department of Environment and Natural Resources (DENR) and the Department of Tourism. After lunch at one of the area’s eateries, we decided to make the 500-m. trek, along a ridge, to Wawa Dam, the prominent landmark of Sitio Wawa. Along the narrow, paved trail are stores selling organic vegetables (eggplant, squash, gabi, takway, puso ng saging, pandan leaves, etc. ), river shrimps, crabs, eels, carp, charcoal, assorted fruits (bananas, papaya,) etc., snacks and beverages to tourists. On Tuesdays and Fridays, foot traffic is heavy on the trail, with young men carrying sacks of fruits and vegetables. After crossing a metal footbridge, we reached the slightly arched dam. Coupled with the beautiful landscape of 80-160 feet high white rock walls, limestone crags and marble boulders, the dam was perfect for photography. Wawa Dam, also known as Montalban Dam, is an 85 m. 9279 ft.) long and 12 m. (40 ft.) high gravity dam constructed over the Marikina River. The slightly arched dam is situated in the 360-m. (1,180 ft.) high Montalban Gorge or Wawa Gorge, a water gap in the Sierra Madre Mountains, east of Manila. The waters of the Upper Marikina River basin, its headwater said to be in Quezon province, runs through the gorge and descends to the lowlands of the neighboring town of San Mateo and Marikina Valley. During summer, cottages are built at the foot of the dam but, as it was the rainy season, they remove the cottages because of the heavy impact of water. The dam was built in 1904, during the American colonial era, started operating in 1909 to provide the water needs for Manila. It used to be the only source of water for the greater Manila area but it was closed in 1962 due to deterioration and lack of water supply and abandoned when it was replaced by the La Mesa-Ipo-Angat watershed system. The sparsity of its water was most likely due to the logging and quarrying in the mountains. However, due to insufficiency of water supply for Metro Manila, there is now a strong clamor to reuse the dam. Wawa Dam is also pictured in their official seal of the local government of Rodriguez. For those who are not fans of mountain hiking, Wawa Dam’s has picnic spots. If you don’t want to bring your own food and beverages, sari-sari stores, food stalls and a wet market are available in the place. You can rent a bamboo cottage (Php150-500) and toilets are Php10 per use (bring your own toiletries or buy them at the sari-sari stores). Wawa Dam: M. H. Del Pilar Street, Sitio Wawa, Brgy. San Rafael, Rodriguez, Rizal, Philippines. By Car: Despite the usual traffic, the fastest route to Wawa is via Commonwealth Ave., then take Payatas Road going to Rodriguez Highway until you reach M.H Del Pilar Street. Inside Wawa Village, there’s a parking space where the locals look after your car for any amount. Travel time is around 1.5 to 2hrs. By Public Transportation: In front of Jollibee, Farmers, Cubao, Quezon City, there’s a UV Express Terminal where you can take the van going to Rodriguez (fare: Php50 per head). Drop-off at Montalban Terminal. Here, you can ride a tricycle going to Wawa Village (fare: Php20 per head). From SM North/Trinoma, you can also ride a UV Express van (fare: Php50) going to Eastwood Montalban and drop off at Eastwood Ministop. Then, ride a jeep going to Wawa (fare: Php8). From the parking lot, you have to walk for 5-10 minutes. Alternatively, from Cubao/SM North/Trinoma, you can ride a bus or jeepney going to Litex and, from there, ride a jeepney going to Montalban Town Center and another jeepney to Wawa. This is much cheaper but a bit of a hassle. Camp General Mateo M. Capinpin, in the mountains of Tanay, is the latest military camp to become a tourist destination. The headquarters of the Philippine Army’s 2nd Infantry Division (2ID), dubbed the “Jungle Fighter” division, it has been included among Rizal province’s tourist destinations. Heroes Wall (Dambana ng Kabayanihan) – inscribed with the names of 2ID soldiers (including their unit and date of death) who died for their country. 2ID Museum – has a display of weapons, explosives and vehicles. The one-storey VIP Building was where deposed Pres. Joseph E. Estrada’s was temporarily detained, from August 21, 2002 to July 14, 2004, when he was tried for plunder. Schools (Colegio de San Agustin, Ateneo de Manila University, Don Bosco College, etc. ), youth groups (Girl Scouts of the Philippines, etc.) and civic groups (Rotary Club, etc.) regularly visit the sprawling camp. Tours, started in 2007 as “Lakbay Kalikasan (environmental tour),” has since been re-launched as “Lakbay Aral (educational tour),” with a daylong set of activities. They host only one group of about 100 participants at a time but, during the summer “peak season,” tour groups arrive almost every week and they sometimes they accommodate two groups at a time. During the tour, they get an opportunity to interact with soldiers who act as the tour guides, playing big brother and big sister to the elementary to college students. The 2ID charges PhP100 per tour participant and PhP150 each for those camping. The funds go to the maintenance of facilities and use of utilities. Welcoming performance from its marching band. Students get to see soldiers “in action.” A 9-member army squad, in full battle gear and camouflage, demonstrate their combat formations and explain their roles, weapons and equipment. Static display. Soldiers fire off their high-powered firearms but with blank ammunition. Soldiers allow students to take photos with them and even carry the firearms (unloaded, of course). A tour of the 2ID museum. A video presentation about the 2ID follows. For lunch, the visitors get to have a “boodle fight” with the soldiers. Guests must provide their own food. To get a taste of the soldiers’ training regimen, students can get on a “mini-obstacle course” that would have them crawling on the ground. They are also treated to zipline, rock wall climbing and rappelling. Division Public Affairs Office: 2nd Infantry Division Philippine Army, Camp General Mateo M. Capinpin, Brgy. Sampaloc, Tanay, Rizal. Mobile number: (0918) 383-5370 and (0948) 867- 2707. Email: dpao2id@gmail.com. Website: www.junglefighterdivision.com. Facebook: http://fb.com/junglefighterdivision. Their primary mission is to teach as many people as they can about contemplative prayer and the contemplative way of life. This wonderful place of prayer, pilgrimage and peace is not a park or a recreational activity area. Rather, it is for those seeking to experience God. Handumanan, the first place that will welcome you upon entering, has a souvenir shop, visitor center (where names are entered in the registration folder at the counter), a booth where you can write petitions and a donation area. RICA volunteers here also orient visitors of the do’s and dont’s while exploring the Regina RICA. The hilltop Regina RICA‘s centerpiece is the iconic, 71-ft. high statue of Our Lady of Regina Rica, a sculpture of the Blessed Virgin Mary holding baby Jesus made by the artist/sculptor, Jose “Jojo” Barcena Jr..
Below her feet is a canopy of clouds with 17 sculptured angels – 16 smiling and the 17th, inside the mantle, which is the crying (symbolizing sorrow for the sins we commit). Just like a pilgrim, the best way to experience Regina RICA is by foot. However, for those who can’t walk inside the facility, there are also shuttle vans or golf carts (PhP5 per pax) that can take visitors, from the gate, to the chapel and all the way to the SULOD on top of the hill and back down again. There are 2 ways to get to Our Lady of Regina RICA and its SULOD. First, you can take Mary’s S (sacred) Trail at El Shaddai Hills, a pathway of 308 steps trail made with bricks (some with footprints of those who gave their love offering) that leads directly to the icon. Here, you have a great view of the RICA Chapel just below the hill. Second, you can follow the Way of the Cross, 14 stations that leads you along a winding road that also leads you to the icon on top of the hill but also tours you to Regina RICA’s other facilities – the Organic Gardens, Regina RICA Chapel, San Jose Rotonda (has a 13-ft. high statue of St. Joseph looking at his family), 13 Candle Stands, Koi Pond, Flower Gardens, Kakahuyan and Sunflower Trail. Upon reaching SULOD, visitors are briefed on what they should do and observe once you enter the adoration area. They will also provide information and history about the Regina RICA, future and current projects and more. After the briefing, visitors will be prompted to go upstairs where a sister of the congregation will invite them to join a short yet spiritually enlightening prayer and meditation in front of the exposed Blessed Sacrament, after which they will be guided to the exit so they can accommodate the next batch. At the Pilgrim’s Labyrinth, visitors are encouraged to slowly follow the path all the way to the center (where they can offer their prayers and meditate) and also the path to go out. On its left side is a gazebo called Tilipunan (from the Ilonggo word meaning “gathering place”). There are candle houses with candles (PhP20 each) in various colors, which represent different intentions – red for courage, blue for peace, green for hope, orange for good health, violet for financial prosperity, brown for safe trip/good job, aqua for thanksgiving, yellow for joy/friend, white for success, rose for love/family and all of the above for abundance. The Pahuwayan sa RICA Columbary and Ossuary is another interesting work of art of Jojo Barcena Jr.
Regina RICA also has a dozens of gazebos, bahay kubo, tents, some animals, livestock, at least 3 waterfalls, a creek, a set of 10,000 trees and a vegetarian-themed restaurant (Pasilungan) at a place called Handong (an Ilonggo word meaning “shade”). Regina Regina Rosarii Institute for Contemplation in Asia: Marikina-Infanta Highway, Sitio Aguho, Brgy. Sampaloc, Tanay Rizal. Open daily (except Tuesdays), 8 AM to 5 PM. Admission: free. Parking fee: PhP50. Tel: (+02) 985-3878 and (+02) 401-2036. Mobile number: (0919) 269-4286. E-mail: reginarica@yahoo.com. Website: www.reginarica.org. To attend to the pilgrims’ need for silence and respect the sanctity and cleanliness of the area, each one is required to be on their best behavior when they are inside the sacred place. There is also a dress code – no short shorts sleeveless blouses, spaghetti straps and too revealing upper garments. If you are wearing inappropriate clothing, you can borrow long skirts and shawls in stores inside the place. Visitors are required to take off their shoes once they enter SULOD. You can take pictures anywhere inside the whole facility except inside SULOD. This natural, multi-level cave, part of several series of caves in the area, was said to have been discovered in 1901 (by a grandfather of one of the cave guides). It was used as a local hideout by refugees during the Philippine-American War and by the Japanese during World War II. We detoured to this cave before proceeding to Daranak Falls. It’s a long and bumpy ride getting there since most of the road isn’t paved yet and the cave isn’t signposted that well. This cave is mostly dry and many of the stalactites and stalagmites, though still impressive, are dead. The cave’s name was derived from the word linaw (clear). During the 15th-18th century, opposing parties used to convene inside the cave to settle disputes. It’s a long cave system with different levels and openings. This cave has 7 levels but most visitors only explore the first two levels. The less visited and seldom explored Levels 3-5 are more challenging to explore as you may need to get your hands dirty. It also requires squeezing your body to fit inside the narrow and small cave openings. It can only be explored during summer as, during the rainy season, they’re flooded and muddy. Levels 6-7 are closed. Our tour took about 30 mins. Our guide Jason told us that one path leads to as far as the town of Montalban (others say that there are those that lead to the neighboring towns of Baras and Pililia). The local TV fantasy series “Encantadia” was filmed here and, more recently, the Coco Martin TV series “Ang Probinsyano.” The TV series “Imortal” disturbed level 1 with silver and gray paint and glued glitters on the cave walls and other indelible and irreversible damage. In case you get hungry or thirsty after the cave exploration, small sari-sari stores in the area sell sandwiches, soft drinks, halo-halo, mais con yelo, and biscuits. As a spelunking experience, this is a relatively easy cave to explore, requiring no technical or special skills, especially for the first 2 levels. Well suited for first timers with no previous spelunking experience. Levels 3-5, taking about half a day to explore, are just satisfying enough for the veterans. Calinawan Cave: Calinawan Road, Brgy. Tandang Kutyo, Tanay, Rizal. Admission: PhP20. Tour guide fee: PhP 200 (good for 10 pax). You are provided with safety helmets and LED flashlights (however, these are very weak and you won’t be able to take great photos inside) as the second level of the cave has zero visibility. For that mandatory picture taking, use a camera with low light function. If you wish to explore layers 3-5, the guide may ask you for a consideration fee. How to Get There: Calinawan Cave can be reached by tricycle (PhP200) from Tanay Market. For those with cars, there’s a parking area in front of the cave entrance. The best-preserved church complex in the province, this church was first built in nipa and bamboo in 1606. In 1678, a church built with stone was started by Fr. Pedro de Espallargas, completed in 1680 (the first mass was celebrated on April 20, 1680) but was demolished due to its deteriorating condition as a result of natural calamities. The present church was started in 1773 and completed in 1783 by Franciscan Fr. Alfonso de Fentañes with good local stone from the Tanay quarry. The six retablos were installed in 1786. On July 31, 2001, it was declared as a National Cultural Treasure by the National Commission for Culture and the Arts and, near the end of 1999, was declared as one of the five Jubilee churches of the Diocese of Antipolo. The church’s massive Early Renaissance, adobe-faced, three-level facade features superpositioned columns topped by carved pineapples, semicircular arched main entrance and windows and a triangular pediment with a statued niche framed by an order. On its left is its four-storey octagonal bell tower with semicircular arched windows and, on its right, is the two-storey convent and courtyard. The convent, now housing the rectory, multi-purpose hall and San Ildefonso College, was started in 1640, repaired in 1773, finished in 1783 by Fr. Fentañes and was repaired and improved in 1851. In front of the church is the “Pamana sa Tanay, Hane! !” a 16 ft. high sculpted from an old acacia tree. Designed by Yvette Beatrice Y Co, it was sculpted by Roel Lazarro, Frank B Gajo and sculptors from both Kalayaan and Paete, Laguna. It depicts the Virgin Mary appearing before St. Ildephonsus. Inside is a long nave, an intricately decorated wooden pulpit and a silver-plated main altar. A relic of a piece of bone of St. Ildephonsus, from Zamora, Spain (where the body of the patron saint lies), is housed in a monstrance. It, was given by Rev. Fr. Felipe Pedraja on October 2006. The celebrated 200-year old bas-reliefs of the 14 Stations of the Cross (Via Crucis), encased in large glass windows across each side of the the nave’s walls, are considered as one of the most beautiful in Asia. Indigenized from Western styles, they are believed to have been created by native Tanay artists. The natives in the carvings have Malay features, with brown skin and squat figures. Native culture is distinctly depicted in the tambuli, made of carabao, and the bolo instead of the typical Roman sword. At the seventh station, one soldier even wears sunglasses. The five ornate retablos, with Rococo design, honor of Our Lady of Anguish (Nuestra Señora de las Angustias), the Immaculate Conception (La Purísima Concepción), Saint Joseph, Saint Peter of Alcantara and the Baptism of Jesus Christ. Church of St. Ildephonsus of Toledo: M.H. Del Pilar St, Brgy. Plaza Aldea, Tanay 1980, Rizal. Tel: (02) 654 1015. Feast of St. Idelfonsus of Toledo: January 23. How to Get There: Taytay is located 55.37 kms. from Manila and 43.7 kms. (a 1 hour 10 min. drive) from Antipolo City. After lunch at a Kentucky Fried Chicken outlet near the Antipolo Cathedral, Jandy and I returned to our Toyota Revo for the last leg of our Antipolo City tour – the Our Lady of Annunciation Church, the first Catholic church built in Antipolo. The church isn’t easy to find as it is located almost outside Antipolo, on the fringe just before getting to Tanay. We found our way there via the Marcos Highway (and asking for directions). The stone and brick church was constructed by the Jesuits in 1700 under the patronage of Our Lady of Annunciation (Nuestra Señora de la Anunciata). In 1768, when the Jesuits were expelled, its management was transferred to Recollect priests. The church was destroyed during the July 18, 1880 earthquake. Since then, the population started dwindling and, as it did not seem important to rebuild the church, it was left in ruins. In 1930, it was totally abandoned when the townspeople were ordered moved to another location to give way for the construction of a proposed dam that would flood the mountain valley of Boso-Boso. When the project didn’t prosper (due to the discovery of an earthquake fault line), the people slowly came back. In 1943, during World War II, what remained of the church was destroyed by fire by the Japanese. In 1995, it was again restored, with the help of the townspeople, to its original design. The present reconstructed church has a simple, single level facade with a centrally located main entrance flanked by two small, semicircular arched windows. Above it is a triangular pediment with a centrally located oculus. On the church’s left is a square bell tower. The side walls are supported by buttresses. Its interior reveal traces of its brick construction. Our Lady of Annunciation Church: Sitio Old Boso-Boso, Brgy. San Jose, Antipolo City, Rizal. How To Get There: From the Masinag/Sumulong intersection, ride a jeepney along Marcos Highway. Upon seeing the Boso-Boso Highlands Resort on the left side, it is a further 2 kms. to dirt road on the left marked with a big metal archway (“Old Boso-Boso, Brgy. San Jose, Antipolo City”). Here, take a 2-km. tricycle ride to the church located on your left. From the Hinulugang Taktak, Jandy and I next proceeded to the nearby Antipolo Cathedral, a favorite pilgrimage site formally known as the Cathedral of the Immaculate Conception National Shrine of Our Lady of Peace and Good Voyage of Antipolo. We were lucky to be able to park at the cathedral grounds and when we entered, a wedding was ongoing. The church was first built from 1630 to 1633 by Jesuit Fr. Juan de Salazar but was burned during the Chinese uprising of November 1639-March 1640. It was rebuilt by Fr. Salazar in 1637 but was destroyed during the earthquakes of 1645, 1824 and 1863. Notable Filipino historians Pedro Chirino and Pedro Murillo Velarde ministered in this shrine. The present church was reconstructed by Msgr. Francisco Avendano and was declared a National Shrine by the bishops of the Philippines in 1954. This modern church, built on the site where the statue of the Virgin was discovered leaning against the trunk of a tipolo (breadfruit) tree (artocarpus incisa), has a circular layout topped by a huge dome and has three main entrances. Gothic influence in the façade is seen from the triangular windows and mouldings. It houses the image of Nuestra Senora de la Paz y Buen Viaje (Our Lady of Peace and Good Voyage). The brown wooded statue was brought to Manila from Mexico by newly appointed Gov.-Gen. Don Juan Niño de Tabora in 1626, via the galleon El Almirante, enshrined in St. Ignatius Church in Intramuros and later entrusted to the Jesuits at Antipolo when Gov. Tabora died in 1632. Declared patron saint of the Manila galleons, it made six successful round trips across the Pacific to Acapulco without mishap from 1648 to 1649 (on the San Luis), 1650 (on the Encarnacion), 1651 to 1653 (on the San Diego), 1659 to 1662 (on the San Javier), 1663 (on the Nuestra Señora del Pilar) and from 1746 to 1748 (on the San Jose). On November 26, 1926, the image was canonically crowned, before 100,000 people in the Luneta, by Manila Archbishop Michael J. O’Doherty. Cathedral of the Immaculate Conception National Shrine of Our Lady of Peace and Good Voyage of Antipolo: Pascual Oliveros St., Antipolo City, Rizal. I recently got an invitation from Ms. Melissa Dizon, a professor, former Exec. Director of North Philippines Visitors Bureau (NPVB) and a Lakbay Norte colleague, to join her in a dance-movement therapy session to be conducted by Ms. Riza Regis (an author, she also conducts crystal healing sessions) at the Symbios Holistic and Wellness Sanctuary, an extension of the BioVitale Holistic Center. The center, a brainchild of owner Dr. Sonny Viloria (a proponent of complementary medicine which blends scientific Western practices with Eastern mysticism), is located in San Mateo, Rizal. Aside from dance-movement therapy, the center also offers laughter yoga (by Paulo Trinidad); Reiki healing (by Mr. Arnel Belenzo); meditation, sound therapy and shiva-shi movement (by Ms. Yet) and lectures on natural medicine by Dr. Viloria himself. I met up with Melissa, with her daughter Bianca and her friend Mr. Jon Ryan ” J.R.” Ng (a photographer and magazine writer), very early in the morning at the Jollibee outlet at the Welcome Rotunda in Quezon City. With J.R. at the wheel of his car, we motored all the way to Mandala Farm Estates where we asked the security guards at the subdivision gate for directions to the center. After some confusion with the given directions, we finally made it to the center’s parking area where we were met by Mr. Ronnie Cruz Bernardo, the center’s de facto media consultant. From the parking, we entered a marble gateway with wooden swing doors, flanked by a Buddha statue and a door bell, and went down, via a pathway (which varies from a combination of gravel, stones and railway sleepers, to stamped concrete) with a number of horseshoe bends, to the center’s native-style, open-air pavilion. The pavilion had a floor of polished wooden planks and bamboo slats and wooden columns that supported wooden rafters and a roof of nipa and bamboo. It is furnished with eclectic furniture from Pampanga, Thailand and Burma, a large area rug plus lots of Eastern statuary of deities (Kuan Yin, Buddha, etc. ), all tastefully arranged by Mr. Chris Munar. One side of the pavilion has a breathtaking view of the mountains of Rizal. 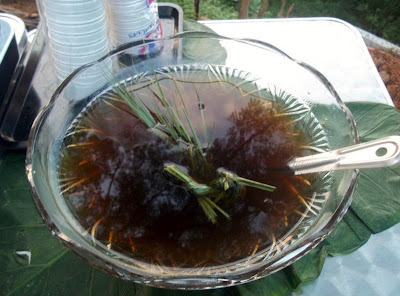 At the pavilion, we were welcomed with a merienda of suman which we washed down with oxygenated water or a refreshing and healthy tea made with lemon grass (tanglad) and camote tops (talbos) infused with mint and sweetened with muscovado sugar. After merienda, Ronnie toured us around the 6,000-sq. m. sanctuary. Near the pavilion are Balinese-style, tastefully designed and furnished cottages (made with concrete as well as local wood, nipa, bamboo and sawali) with capiz windows that can accommodate 6 guests while below the pavilion is a social area (where one can set up tents) with a koi pond and mini fountain. Beside it is the food tent and the sun therapy (essential for natural healing) area with its pair of cushioned lounge chairs. Part of the nature trail is lighted, come cool evening, by eco-friendly, solar-powered lamps and the natural light of fireflies (alitaptap). Just about every nook and cranny of the center is filled with the healing sound of natural water. Running within the property is a crystal-clear brook which feeds a man-made, stone-lined lagoon (an ideal swimming area) below with cool spring water. On one side of the lagoon is an Eastern-themed bas relief while overlooking the lagoon is a wooden meditation platform. A pond, with a covered bamboo and nipa platform (where one can do fishing), is filled with organic tilapia, floating duck weed and Azola (mosquito fern), a natural weed that is very rich in protein, vitamins and minerals. Smaller ponds can also be found along the trail. The piece de resistance is a small waterfall whose natural beauty inspired Dr. Viloria to buy the property. Up a hill, accessed by a wooden stair, is a meditation platform, a mini version of the pavilion, where one can do yoga, meditate, relax or just take a mid-afternoon siesta while enjoying the great nature view. Intersperse within a shady bamboo and giant fern grove are a pair of wooden benches and a native hammock (duyan). 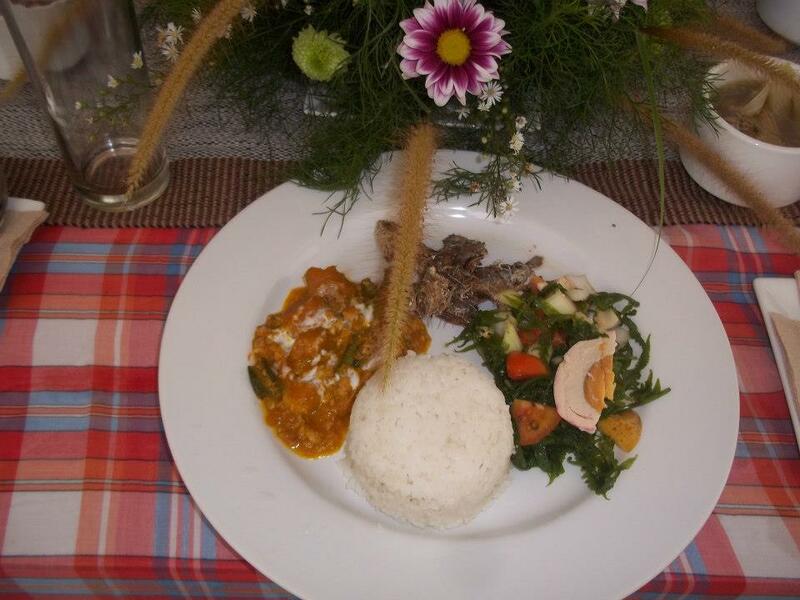 Come lunch, we were all served, inside a food tent, tawilis, pinakbet, kalabasa in coconut milk, pako (vegetable fern) salad and clam soup, all complement with organic rice cooked in pandan leaves. This self-sufficient center promotes the locavore lifestyle – eating food that is locally produced. Meals served here are prepared, by chef Jen (a London-trained therapist and food connoisseur) at her food preparation cottage, from mostly homegrown, organic ingredients; from papayas, guavas, bananas, camote (sweet potatoes), taro, wild spinach, medicinal herbs and spices as well as tilapia and free-range (stress-free with no hormones and antibiotics) native chicken and ducks. From these, they are able to prepare their very own signature dishes such as laing, chicken adobo, banana heart salad, chicken sinampalukan (sour soup with chicken and tamarind leaves) and tilapia in coconut milk and petsay. Prior to leaving the center, we were all treated to a merienda cena, again at the food tent, of fresh lumpiang ubod, a Negros Occidental (especially in my mom’s hometown Silay City) favorite (and mine). This spring roll is filled with sautéed ubod (heart of palm), shrimps, tahure (bean cake) and bits of pork. Its sauce, topped with roasted garlic bits, created a unique flavor. Melissa and I liked it so much, we shared a second piece. In the near future, the center plans to include regular hilot (the ancient Filipino art of massage) and dagdagay (a soothing and cleansing routine using native sticks for tired feet, from Ifugao and Mountain Province) service for its regular patrons. Symbios Holistic and Wellness Sanctuary: Mandala Farm Estate, Timberland Heights, San Mateo, Rizal. BioVitale Holistic Center: G/F, CRB Bldg., EDSA, Cubao, Quezon City. Tel: (632) 448-7625 to 26. Mobile number: (0921) 260-8459.